**This class series is great for beginners to SoulCollage® or returning students who want to dive deeper and make more cards. Commitment has rewards! 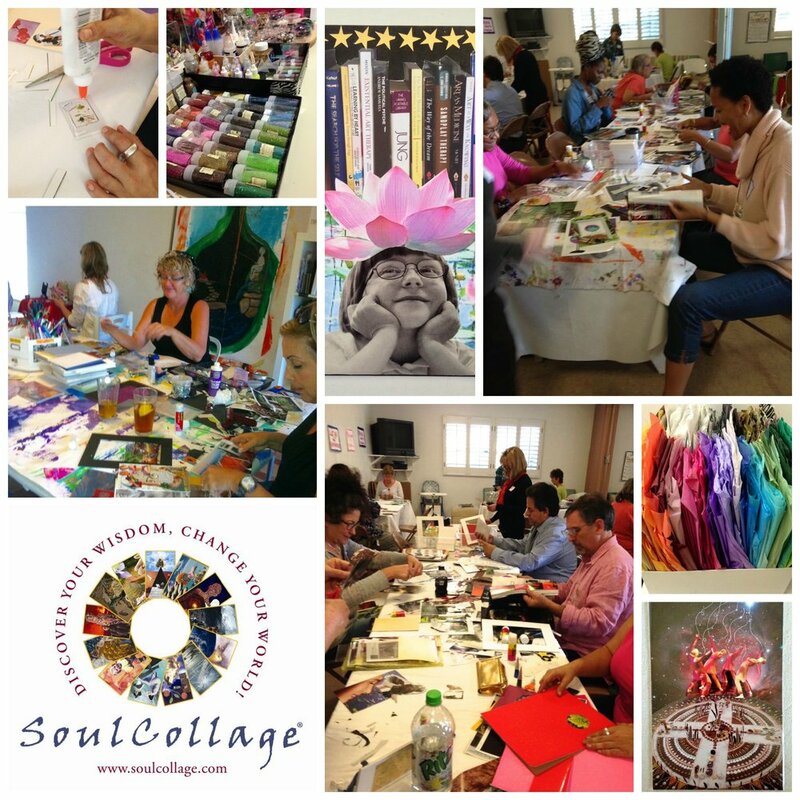 Pay for all 6 weeks of the course in advance and reserve your very own "SoulCollage® Swag Bag" including the SoulCollage® book and take-home card-making supplies. $40 value. Each session includes a specific topic, card making session and sharing what our cards have to say to us! Over time you will learn how to tap into your intuitive wisdom for healing and transformation. All supplies included, if you can use scissors and glue this process is for you! Drop in by the week or sign up for the whole series and receive a "swag bag" of SoulCollage supplies to take home! Bring a journal if you have one. How to keep written journal of your SoulCollage® process as your personal story unfolds. Feb. 6th - 6 - 9 pm - 6 week series begins - Introduction to this creative and intuitive process. During this session you will get an overview of the SoulCollage® process, which includes: learning to trust your intuition; intuitive image gathering and card making; and giving voice to your cards using the ‘I AM ONE WHO…” voice. You will learn that some images are guides, allies or challengers and may represent internal voices or external ones. The story of you will begin to unfold before your eyes as you make your very first card(s) in this session! Feb. 13 - 6 – 9 pm - Who am I? During this session you will learn ‘The Committee Suit’, which is the psychological suit. This suit acknowledges the inner parts of one’s personality. Over time you will learn how to give voice to your various personality parts; the critic, the wounded child; the shy one; wonder woman; etc. Feb. 20 - 6 – 9 pm - - Honoring Your Friends, Family and Ancestors -- In this session we will make cards called ‘The Community Suit’ to honor the people, pets, family, and historical figures who have impacted our life and, in part, made us who WE ARE with their special gifts and challenges to us. Bring pictures of your community people if you wish. Feb. 27th – 6 - 9 pm Discovering archetypal patterns and forces that guide your life - In this session discover your own “Supreme Council” of wise beings you can consult to guide and direct your life. The cards in your ‘Council Suit’ are not just ANY wise beings they are YOUR wise beings: the archetypal forces that speak directly to you (if only you will identify them and listen!). March 6th – 6 – 9 pm - Revealing unacknowledged voices from deep within – In this session we will learn all about your animal totems, or power animals that correspond with the seven major chakras or energy centers. The animals in this suit are discovered through a guided imagery meditation. We call these cards ‘The Companion Suit’. March 13th – 6 – 9 pm - Experiencing the One and the Many! During this session you will make what we call ‘The Transpersonal Cards’. These three cards represent the Mystery from which all forms are manifested, the spark within us that is unique, and that part of us that can see us without judgment. We will also demonstrate and experience how to read our cards to understand the value of having our own images speak to us from our soul.